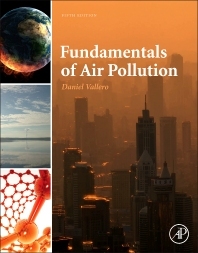 Fundamentals of Air Pollution is an important and widely used textbook in the environmental science and engineering community. This thoroughly revised fifth edition of Fundamentals of Air Pollution has been updated throughout and remains the most complete text available, offering a stronger systems perspective and more coverage of international issues relating to air pollution. Sections on pollution control have been reorganized and updated to demonstrate the move from regulation and control approaches to green and sustainable engineering approaches. The fifth edition maintains a strong interdisciplinary approach to the study of air pollution, covering such topics as chemistry, physics, meteorology, engineering, toxicology, policy, and regulation. New material includes near-road air pollution, new risk assessment approaches, indoor air quality, the impact of biofuels and fuel additives, mercury emissions, forecasting techniques, and the most recent results from the National Air Toxics Assessment. Students in senior and graduate courses in air pollution and control taught in departments of environmental science and engineering, atmospheric science, and public health; practitioners looking for the latest information on pollution science. 3.3. What is Air Pollution? Dr. Daniel A. Vallero is an internationally recognized expert in environmental science and engineering. His four decades of research, teaching and professional experience in hazardous waste engineering and management have addressed a wide range of human health risk and ecological issues, from global climate change to the release of hazardous wastes. His research has advanced the state-of-the-science of air and water pollution measurement, models of potential exposures to chemicals in consumer products, and environmental impact assessments. He established the Engineering Ethics program and is a key collaborator in the Responsible Conduct of Research Program at Duke University. These programs introduce students, from first-year through PhD, to the complex relationships between science, technology and societal demands on the engineer. The lessons learned from the cases in this book are a fundamental part of Duke’s preparation of its future engineers to address the ethical dilemmas likely to be encountered during the careers of the next generation engineers. Dr. Vallero received a bachelor’s degree from Southern Illinois University, a Master of Science in City & Regional Planning from SIU, a Masters in Civil & Environmental Engineering (Environmental Health Sciences) from the University of Kansas, and a PhD in Civil & Environmental Engineering from Duke.